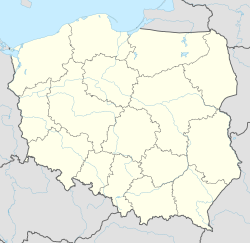 listen) (Latin: Posnania; German: Posen) is a city on the Warta river in west-central Poland, the region called Wielkopolska (Greater Poland). The city population is about 550,000, while the continuous conurbation with Poznan County and several other communities (Oborniki, Skoki, Szamotuły and Śrem) is inhabited by almost 1.1 million people. The Larger Poznań Metropolitan Area (PMA) is inhabited by 1.3-1.4 million people and extends to such satellite towns as Nowy Tomyśl, Gniezno and Wrzesnia, making it the fourth largest metropolitan area in Poland. Poznań is among the oldest cities in Poland and was one of the most important centers in the early Polish state in the tenth and eleventh centuries. The first center city was Ostrów Tumski, the natural island on the Warta river-very similar to the Île de la Cité in Paris. The first rulers were buried in Poznań's cathedral on the island. It also served as the capital for a short time in the 13th century, hence the official name: The capital city of Poznan. Poznań is one of the biggest cities in Poland. It is the historical capital of the Wielkopolska (Greater Poland) region and is currently the administrative capital of the province called Greater Poland Voivodeship. Poznań is today one of the largest Polish centers of trade, industry, sports, education, technology, tourism and culture. It is particularly important academic center, with about 130,000 students and the third biggest Polish university - Adam Mickiewicz University. It is also the residence of the oldest Polish diocese, now being one of the most populous archdioceses in the country. The city hosts regular international trade fairs and was the host city for the United Nations Climate Change Conference in December 2008, a key stage in the creation of a successor to the Kyoto Protocol. Poznań was one of the host cities for the association football tournament UEFA Euro 2012. The city also hosts a number of rowing world cup events by the Malta lake (for example "ICF Canoe Sprint World Championships" in 1990, 2001, and again in 2010). Also, a great number of various international festivals takes place in the city - Transatlantyk – Poznań International Film and Music Festival, "Malta International Theater Festival", "ANIMATOR (festival)" and Maski Festival to name just a few. In addition, the International Henryk Wieniawski Violin Competition, the oldest violin competition in the world, is held in Poznań every five years. In 2012, the Poznań's Art and Business Center "Stary Browar" won a competition organized by National Geographic Traveller and was given the first prize as one of the seven "New Polish Wonders". Poznań has been rated highly, often coming first for Poland, as a city with a very high quality of life. The city has also won many times a prize awarded by "Superbrands" for a very high quality brand of city of Poznań. Poznań was classified in 2010 as high sufficiency city by Globalization and World Cities Research Network. The official patron saints of Poznań are Saint Peter and Paul of Tarsus, the patrons of the cathedral. As a patron of the city is regarded as well the patron of the main street Święty Marcin - Martin of Tours. The name Poznań probably comes from a personal name, Poznan, (from the Polish participle poznan(y) – "one who is known/recognized"), and would mean "Poznan's town". It is also possible that the name comes directly from the verb poznać, which means "to get to know" or "to recognize". It may simply mean "known town". The earliest surviving references to the city are found in the chronicles of Thietmar of Merseburg, written between 1012 and 1018: episcopus Posnaniensis ("bishop of Poznań", in an entry for 970) and ab urbe Posnani ("from the city of Poznań", for 1005). The city's name appears in documents in the Latin nominative case as Posnania in 1236 and Poznania in 1247. The phrase in Poznan appears in 1146 and 1244. The city's full official name is Stołeczne Miasto Poznań ("The Capital City of Poznań"), in reference to its role as a centre of political power in the early Polish state. Poznań is known as Posen in German, and was officially called Haupt- und Residenzstadt Posen ("Capital and Residence City of Poznań") between 20 August 1910 and 28 November 1918. The Latin names of the city are Posnania and Civitas Posnaniensis. Its Yiddish name is פּױזן, or Poyzn. The Russian version of the name, Познань (Poznan'), is of feminine gender, in contrast to the Polish name, which is masculine. In reunited Poland, and later in the Polish–Lithuanian Commonwealth, Poznań was the seat of a voivodeship. The city's importance began to grow in the Jagiellonian period, due to its position on trading routes from Lithuania and Ruthenia to western Europe. It would become a major centre for the fur trade by the late 16th century. Suburban settlements developed around the city walls, on the river islands and on the right bank, with some (Ostrów Tumski, Śródka, Chwaliszewo, Ostrówek) obtaining their own town charters. However the city's development was hampered by regular major fires and floods. On 2 May 1536 a blaze destroyed 175 buildings, including the castle, the town hall, the monastery and the suburban settlement called St. Martin. In 1519 the Lubrański Academy had been established in Poznań as an institution of higher education (but without the right to award degrees, which was reserved to Kraków's Jagiellonian University). However a Jesuits' college, founded in the city in 1571 during the Counter-Reformation, had the right to award degrees from 1611 until 1773, when it was combined with the Academy. In the second half of the 17th century and most of the 18th, Poznań was severely affected by a series of wars (and attendant military occupations, lootings and destruction) – the Second and Third Northern Wars, the War of the Polish Succession, the Seven Years' War and the Bar Confederation rebellion. It was also hit by frequent outbreaks of plague, and by floods, particularly that of 1736, which destroyed most of the suburban buildings. The population of the conurbation declined (from 20,000 around 1600 to 6,000 around 1730), and Bambergian and Dutch settlers (Bambrzy and Olędrzy) were brought in to rebuild the devastated suburbs. In 1778 a "Committee of Good Order" (Komisja Dobrego Porządku) was established in the city, which oversaw rebuilding efforts and reorganized the city's administration. However in 1793, in the Second Partition of Poland, Poznań, came under the control of the Kingdom of Prussia, becoming part of (and initially the seat of) the province of South Prussia. The city continued to expand, and various projects were funded by Polish philanthropists, such as the Raczyński Library and the Bazar hotel. The city's first railway, running to Stargard in Pommern (now Stargard Szczeciński), opened in 1848. Due to its strategic location, the Prussian authorities intended to make Poznań into a fortress city, building a ring of defensive fortifications around it. Work began on the citadel (Fort Winiary) in 1828, and in subsequent years the entire set of defences (Festung Posen) was completed. Another expansion of Festung Posen was planned, with an outer ring of more widely spaced forts around the perimeter of the city. Building of the first nine forts began in 1876, and nine intermediate forts were built from 1887. The inner ring of fortifications was now considered obsolete and came to be mostly taken down by the early 20th century (although the citadel remained in use). This made space for further civilian construction, particularly the Imperial Palace ("Zamek"), completed 1910, and other grand buildings around it (including today's central university buildings and the opera house). The city's boundaries were also significantly extended to take in former suburban villages: Piotrowo and Berdychowo in 1896, Łazarz, Górczyn, Jeżyce and Wilda in 1900, and Sołacz in 1907. After World War I the Greater Poland Uprising (1918–1919) brought Poznań and most of the region under Polish control, confirmed by the Treaty of Versailles. The local populace had to acquire Polish citizenship or leave the country. This led to a significant decline of ethnic Germans, whose number decreased from 65,321 in 1910 to 5,980 in 1926 and further to 4,387 in 1934. In the interwar Second Polish Republic, the city again became the capital of Poznań Voivodeship. Poznań's university (today called Adam Mickiewicz University) was founded in 1919, and in 1925 the Poznań International Fairs began. In 1929 the fairs site was the venue for a major National Exhibition (Powszechna Wystawa Krajowa, popularly PeWuKa) marking the tenth anniversary of independence; it attracted around 4.5 million visitors. The city's boundaries were again expanded in 1925 (to include Główna, Komandoria, Rataje, Starołęka, Dębiec, Szeląg and Winogrady) and 1933 (Golęcin, Podolany). During the German occupation of 1939–1945, Poznań was incorporated into the Third Reich as the capital of Reichsgau Wartheland. Many Polish inhabitants were executed, arrested, expelled to the General Government or used as forced labour; at the same time many Germans and Volksdeutsche were settled in the city. The German population increased from around 5,000 in 1939 (some 2% of the inhabitants) to around 95,000 in 1944. The pre-war Jewish population of about 2,000  were mostly murdered in the Holocaust. A concentration camp was set up in Fort VII, one of the 19th-century perimeter forts. The camp was later moved to Żabikowo south of Poznań. The Nazi authorities significantly expanded Poznań's boundaries to include most of the present-day area of the city; these boundaries were retained after the war. Poznań fell to the Red Army, assisted by Polish volunteers, on 23 February 1945 following the Battle of Poznań, in which the German army conducted a last-ditch defence in line with Hitler's designation of the city as a Festung. The Citadel was the last point to fall, and the fighting left much of the city, particularly the Old Town, in ruins. The Poznań 1956 protests are seen as an early expression of resistance to communist rule. In June 1956, a protest by workers at the city's Cegielski locomotive factory developed into a series of strikes and popular protests against the policies of the government. After a protest march on June 28 was fired on, crowds attacked the communist party and secret police headquarters, where they were repulsed by gunfire. Riots continued for two days until being quelled by the army; 67 people were killed according to official figures. The most recent expansion of the city's boundaries took place in 1987, with the addition of new areas mainly to the north, including Morasko, Radojewo and Kiekrz. The first free local elections following the fall of communism took place in 1990. With the Polish local government reforms of 1999, Poznań again became the capital of a larger province (Greater Poland Voivodeship). It also became the seat of a powiat ("Poznań County"), with the city itself gaining separate powiat status. Recent infrastructural developments include the opening of the fast tram route (Poznański Szybki Tramwaj, popularly Pestka) in 1997, and Poznań's first motorway connection (part of the A2 autostrada) in 2003. In 2006 Poland's first F-16 Fighting Falcons came to be stationed at the 31st Air Base in Krzesiny in the south-east of the city. Poznań continues to host regular trade fairs and international events, including the United Nations Climate Change Conference. It was one of the host cities for UEFA Euro 2012. Poznań covers an area of 261.3 km2 (100.9 sq mi), and has coordinates in the range 52°17'34''–52°30'27''N, 16°44'08''–17°04'28''E. Its highest point, with an altitude of 157 m (515 ft), is the summit of Góra Moraska (Morasko Hill) within the Morasko meteorite nature reserve in the north of the city. The lowest altitude is 60 m (197 ft), in the Warta valley. Półwiejska Street is one of the city's many pedestrianised central streets. Poznań's main river is the Warta, which flows through the city from south to north. As it approaches the city centre it divides into two branches, flowing west and east of Ostrów Tumski (the cathedral island) and meeting again further north. The smaller Cybina river flows through eastern Poznań to meet the east branch of the Warta (that branch is also called Cybina – its northern section was originally a continuation of that river, while its southern section has been artificially widened to form a main stream of the Warta). Other tributaries of the Warta within Poznań are the Junikowo Stream (Strumień Junikowski), which flows through southern Poznań from the west, meeting the Warta just outside the city boundary in Luboń; the Bogdanka and Wierzbak, formerly two separate tributaries flowing from the north-west and along the north side of the city centre, now with their lower sections diverted underground; the Główna, flowing through the neighbourhood of the same name in north-east Poznań; and the Rose Stream (Strumień Różany) flowing east from Morasko in the north of the city. The course of the Warta in central Poznań was formerly quite different from today: the main stream ran between Grobla and Chwaliszewo, which were originally both islands. The branch west of Grobla (the Zgniła Warta – "rotten Warta") was filled in late in the 19th century, and the former main stream west of Chwaliszewo was diverted and filled in during the 1960s. This was done partly to prevent floods, which did serious damage to Poznań frequently throughout history. Poznań's largest lake is Jezioro Kierskie (Kiekrz Lake) in the extreme north-west of the city (within the city boundaries since 1987). Other large lakes include Malta (an artificial lake on the lower Cybina, formed in 1952), Jezioro Strzeszyńskie (Strzeszyn Lake) on the Bogdanka, and Rusałka, an artificial lake further down the Bogdanka, formed in 1943. The latter two are popular bathing places. Kiekrz Lake is much used for sailing, while Malta is a competitive rowing and canoeing venue. The city centre (including the Old Town, the former islands of Grobla and Chwaliszewo, the main street Święty Marcin and many other important buildings and districts) lies on the west side of the Warta. Opposite it between the two branches of the Warta is Ostrów Tumski, containing Poznań Cathedral and other ecclesiastical buildings, as well as housing and industrial facilities. Facing the cathedral on the east bank of the river is the historic district of Śródka. Large areas of apartment blocks, built from the 1960s onwards, include Rataje in the east, and Winogrady and Piątkowo north of the centre. Older residential and commercial districts include those of Wilda, Łazarz and Górczyn to the south, and Jeżyce to the west. There are also significant areas of forest within the city boundaries, particularly in the east adjoining Swarzędz, and around the lakes in the north-west. For more details on Poznań's geography, see the articles on the five districts: Stare Miasto, Nowe Miasto, Jeżyce, Grunwald and Wilda. The climate of Poznań is within the transition zone between a humid continental and oceanic climate and with relatively cold winters and warm summers. Snow is common in winter, when night-time temperatures are typically below zero. In summer temperatures may often reach 30 °C (86 °F). Annual rainfall is less than 500 mm (20 in), among the lowest in Poland. The rainiest month is July, mainly due to short but intense cloudbursts and thunderstorms. The number of hours of sunshine is among the highest in the country. Climate in this area has mild differences between highs and lows, and there is adequate rainfall year round. The Köppen Climate Classification subtype for this climate is "Cfb" (Marine West Coast Climate/Oceanic climate). Poznań is divided into 42 neighbourhoods (osiedles), each of which has its own elected council with certain decision-making and spending powers. The first uniform elections for these councils covering the whole area of the city were held on 20 March 2011. Citizens of Poznań thanks to the strong economy of the city and high salaries started moving to suburbs (Powiat Poznanski) in the 90's. Although the number of inhabitants in Poznań itself was decreasing for the past two decades, the suburbs gained almost twice as much inhabitants. Thus, Poznań urban area has been growing steadily over past years and has already reached 1.0 million inhabitants when student population is included, whereas the entire metropolitan zone may have reached 1.5-1.7 million inhabitants when satellite cities and towns (so-called second Poznań ring counties such as Wrzesnia, Gniezno and Koscian) are included. The complex infrastructure, population density, number of companies and gross product per capita of Poznań suburbs may be only compared to Warsaw suburbs. It is interesting to note that many parts of closer suburbs (for example Tarnowo Podgorne, Komorniki, Suchy Las, Dopiewo) produce more in terms of GDP per capita than the city itself. Poznań has been an important trade centre since the Middle Ages. Starting in the 19th century, local heavy industry began to grow. Several major factories were built, including the Hipolit Cegielski steel mill and railway factory (see H. Cegielski - Poznań S.A.). Nowadays Poznań is one of the major trade centers in Poland. Poznań is regarded as the second most prosperous city in Poland after Warsaw. The city of Poznań produced PLN 31.8 billion of Poland's gross domestic product in 2006. It boasts a GDP per capita of 200,4% (2008) of Poland's average. Furthermore, Poznań had very low unemployment rate of 2.3% as of May 2009. For comparison, Poland's national unemployment rate was over 10%. Many Western European companies have established their Polish headquarters in Poznań or in the nearby towns of Tarnowo Podgórne and Swarzędz. Most foreign investors are German and Dutch companies (see List of corporations in Poznań), with a few others. Investors are mostly from the food processing, furniture, automotive and transport and logistics industries. Foreign companies are primarily attracted by low labour costs and by the relatively good road and railway network, good vocational skills of workers and relatively liberal employment laws. The recently built Stary Browar shopping center contains many high-end shops and is considered one of the best in Europe. It has won an award for the best shopping center in the world in the medium-sized commercial buildings category. Other notable shopping centers in the city include Galeria Malta, one of the largest in Central Europe, and the shops at the Hotel Bazar, a historical hotel and commercial center in the Old Town. This is a list of major corporations based in Poznań and the city's vicinity. The abbreviation "Sp. z o.o." stands for "Spółka z ograniczoną odpowiedzialnością", or Limited Liability Company, the equivalent of British Ltd. or German GmbH. The abbreviation for Public Limited Company (a stock company or PLC) is "Spółka Akcyjna" or S.A.
Poznań has an extensive public transport system, consisting of trams (see Tramways in Poznań, especially Poznański Szybki Tramwaj) and urban and suburban buses. The main railway station is Poznań Central Station to the southwest of the city centre; there is also the smaller Poznań Wschód and Poznań Garbary station northeast of the centre and a number of other stations on the outskirts of the city. The main east-west A2 motorway runs south of the city connecting it with Berlin in the west and Łódż and Warsaw in the east; other main roads run in the direction of Warsaw, Bydgoszcz, Wągrowiec, Oborniki, Katowice, Wrocław, Buk and Berlin. An intensive programme of road building and improvement in and around the city is underway in preparation for the hosting of matches in the Euro 2012 football championships. Poznań has one of the biggest airports in the west of Poland called Poznań-Ławica Airport. In 2010 it handled approximately 1.5 million passengers. Poznań has many historic buildings and sights, mostly concentrated around the Old Town and other parts of the city centre. Many of these lie on the Royal-Imperial Route in Poznań – a tourist walk leading through the most important parts of the city showing its history, culture and identity. Portions of the city center are listed as one of Poland's official national Historic Monuments (Pomnik historii), as designated November 28, 2008, along with other portions of the city's historic core. Its listing is maintained by the National Heritage Board of Poland. The former Imperial Castle is now one of Poznań's premier cultural-theatrical institutions. Results of new extensive archaeological research performed on Poznan's Ostrow Tumski by prof. zw dr hab. Hanna Kocka-Krec z Instytutu Prahistorii UAM indicate that Poznań indeed was a central site of the early Polish State (recent discovery of first Polish ruler, Mieszko I's Palatium). Thus, the Ostrow Tumski Island is more important that it was thought previously and may have been as important as "Gniezno" in the Poland of first "Piasts". In the near future "Ostrow Tumski of Poznan" is supposed to have a very rich historical exposition, which is being under construction these? days and will be a very interesting place for visitors of Poznan. This will include all sorts of attractions: above mentioned Cathedral, Church of St. Mary the Virgin in Poznan, "Lubranski Academy" and newly opened in 2012 "Genius Loci Archeological Park" and Interactive Center of Ostrow Tumski History ("ICHOT") planned to be opened in 2013 presenting Polish State through many different periods in a form of multimedia museum. "Palatium in Poznan" will be also transformed into a museum, although more funds are needed. When all the expositions are ready in a couple of years Ostrow Tumski may be as worth visiting as "Wawel" in Cracow. There is a very famous sentence illustrating the importance of Ostrow Tumski in Poznań by the Pope John Paul II: "Poland began here". One of the most interesting places in Poznań is Malta with an artificial lake in its center. On one bank of the lake there are ski and sleigh slopes (Malta Ski), on the opposite bank a huge complex of swimming pools including an Olympic-size one (Termy Maltanskie). This whole recreational city "district" is a unique attraction in a whole of Poland or even Europe. Perhaps the most important cultural event in Poznań is the annual Malta theatre festival, which takes place at many city venues usually in late June and early July. It hosts mainly modern experimental off-theatre performances, often taking place on squares and other public spaces. It also includes cinema, visual, music and dancing events. Malta Theatre Festival gave birth to many off-theater groups, expressing new ideas in an already rich theatrical background of the city. Thus, Poznań with a great deal of off-theaters and their performances has recently become a new Polish off-theater performance center. Classical music events include the Henryk Wieniawski Violin Competition (held every 5 years), and classical music concerts by the city's Philharmonic Orchestra held each month in the University Aula. Especially popular are concerts by the Poznań Nightingales. Poznan is also home to new forms of music such as rap and hip-hop made by a great deal of bands and performers ("Peja", "Mezo" and others). Poznań is also known for its rock music performers (Muchy, Malgorzata Ostrowska). Poznan apart from many traditional theaters with a long history ("Teatr Nowy", "Teatr Wielki", "Teatr Polski", "Teatr Muzyczny" and several others) is also home to a growing number of alternative theater groups, some of them stemming from International Malta Festival: "Teatr Strefa Ciszy", "Teatr Porywcze Cial", "Teatr Usta Usta", "Teatr u Przyjaciol", "Teatr Biuro Podrozy", "Teatr Osmego Dnia" and many, many others – it is believed that even up to 30 more or less known groups may work in the city. Every year on the 11th of November, Poznanians celebrate The Day of St. Marcin Street. A procession of horses, with St. Marcin at the head, parades along St Marcin Street, in front of The Imperial Castle. Everybody can eat delicious croissants, the regional product of Poznań. Poznań hosted the 2009 European Young Adults Meeting of the ecumenical Christian Taizé Community. Poznań also stages the "Ale Kino!" International Young Audience Film Festival in December and "Off Cinema" festival of independent films. Other festival: "Transatlantyk" (film music festival by Jan A.P. Kaczmarek started in 2011), Maski Theater Festival, Dance International Workshops by Polish Dance Theater, Made in Chicago (Jazz Festival), Ethno Port, Festival of Ice Sculpture, Animator, Science and Art Festival, Tzadik (Jewish music festival), Meditations Biennale (Modern Art). The full list of cultural annual events is even longer. Poznań has several cinemas, including multiplexes and smaller cinemas, an opera house, several other theatres, and museums. The "Rozbrat" squat serves as a home for squatters and as a centre of independent and open-minded culture. It hosts frequent gigs, an anarchistic library, vernissages, exhibitions, annual birthday festival (each October), poetry evenings and graffiti festivals. The city centre has many clubs, pubs and coffee houses, mainly in the area of the Old Town. "Adam Mickiewicz University" is one of the three best universities in Poland after University of Warsaw and Jagiellonian University of Cracow. They all have a very high number of international student and scientist exchange, research grants and top publications. In northern suburbs of Poznań a very large "Morasko Campus" has been built (Faculty of Biology, Physics, Mathematics, Chemistry, Political Sciences, Geography). The majority of faculties are already open, although a few more facilities will be constructed. The campus infrastructure belongs to the most impressive among Polish universities. Also, there are plans for "Uniwersytecki Park Historii Ziemii" (Earth History Park), one of the reason for the park construction is a "Morasko meteorite nature reserve" situated close by, it is one of the rare sites of Europe where a number of meteorites fell and some traces may be still seen. Poznan with its almost 30 colleges and universities has a second richest educational offer in Poland after Warsaw. AZS AWF Poznań – women's volleyball team playing in Polish Seria A Women's Volleyball League: 8th place in 2003/2004 season. Lake Malta in Poznań hosted the World Rowing Championships in 2009 and has previously hosted some regattas in the Rowing World Cup. It also hosted the ICF Canoe Sprint World Championships (sprint canoe) in 1990 and 2001, and will do so again in 2010. U-19 Euro Championship in VI 2006 – Open and Final. Warta Poznań – men's football team (Polish Champion: 1929, 1947), currently plays in the Polish First League. WKS Grunwald Poznań – sports club with sections in field hockey, shooting, wrestling, handball and tennis. KS Sobieski Poznań – wrestling. Since the end of the communist era in 1989, Poznań municipality and suburban area have invested heavily in infrastructure, especially public transport and administration. That results in a massive investment from foreign companies in Poznań as well as in communities west and south of Poznań (namely, Kórnik and Tarnowo Podgórne). One of the most important values of Poznań is the positive attitude of public administration towards investments, and less bureaucracy than elsewhere in Poland. City investments into transportation were mostly into public transport. While the number of cars since 1989 has at least doubled, the policy of improving public transport gave good effects. Limiting car access to the city center, building new tram lines (including Poznański Szybki Tramwaj) and investing in new rolling stock (such as modern Combino trams by Siemens and Solaris low-floor buses) actually increased the level of ridership. This is a notable success, even considering the fact that Polish society only possesses about half of the "old EU"'s purchasing power, hence not everybody can afford to own a car. Future investments into transportation include the construction of a third bypass of Poznań, and the completion of A2 (E30) motorway towards Berlin. New cycle lanes are being built, linking to existing ones, and an attempt is currently being made to develop a Karlsruhe-style light rail system for commuters. All this is made more complicated (and more expensive) by the heavy neglect of transport infrastructure throughout the Communist era. Wikisource has the text of the 1911 Encyclopædia Britannica article Posen (city). ^ Brather, Sebastian (2001) (in German). Archäologie der westlichen Slawen. Siedlung, Wirtschaft und Gesellschaft im früh- und hochmittelalterlichen Ostmitteleuropa. Ergänzungsbände zum Reallexikon der germanischen Altertumskunde. 30. Walter de Gruyter. pp. 87, 156, 159. ISBN 3-11-017061-2. ^ Brather, Sebastian (2001) (in German). Archäologie der westlichen Slawen. Siedlung, Wirtschaft und Gesellschaft im früh- und hochmittelalterlichen Ostmitteleuropa. Ergänzungsbände zum Reallexikon der germanischen Altertumskunde. 30. Walter de Gruyter. p. 87. ISBN 3-11-017061-2. "Das städtische Bürgertum war auch in Polen und Böhmen zunächst überwiegend deutscher Herkunft. [English: Also in Poland and Bohemia were the burghers in the towns initially primarily of German origin.]" ^ Kotowski, Albert S. (1998) (in German). Polens Politik gegenüber seiner deutschen Minderheit 1919-1939. Forschungsstelle Ostmitteleuropa, University of Dortmund. p. 56. ISBN 3-447-03997-3. http://books.google.de/books?id=KVg_tMs_ZPIC&pg=PA365&dq=Goetheschule+Graudenz#v=onepage&q=adelnau&f=false. ^ Jerzy Topolski. Dzieje Poznania w latach 1793-1945: 1918-1945. PWN. 1998. pp. 958, 1425. ^ "Trial of gauleiter Artur Greiser". Law Reports of Trials of War Criminals. United Nations War Crimes Commission. Wm. S. Hein Publishing. 1997. p. 86. ^ a b c d e f g h i j k l m n o "Poznań - Miasta partnerskie" (in Polish). 1998–2013 Urząd Miasta Poznania. City of Poznań. Archived from the original on 2013-09-23. http://web.archive.org/web/20130923062530/http://www.poznan.pl/mim/publikacje/pages.html?co=list&id=19&ch=20&instance=1017&lang=pl. Retrieved 2013-12-11. (in Polish) © 1998–2008 Urząd Miasta Poznania. http://www.poznan.pl/mim/public/publikacje/pages.html?co=list&id=19&ch=20&instance=1017&lang=pl. Retrieved 2008-11-29. ^ "City of Brno Foreign Relations - Statutory city of Brno" (in Czech). 2003 City of Brno. http://www2.brno.cz/index.php?lan=en&nav01=2222&nav02=1249. Retrieved 6 September 2011. Wikivoyage has a travel guide for Poznań. This page uses content from the English language Wikipedia. The original content was at Poznań. The list of authors can be seen in the page history. As with this Familypedia wiki, the content of Wikipedia is available under the Creative Commons License.